$275.00 for non-members of NALA. Retake is $60.00. For ACT Testing Centers Information go to: www.nala.org/NALANEWS16.aspx or contact NALA Liaison Stephanie B. Elliott, NCCP at [email protected]. The NALA Certifying Board has announced new specifications for the Certified Paralegal examination effective with the September 2013 testing window. These modifications are based on a careful and detailed analysis of the findings of the 2012 Job Task Analysis study conducted by the Board in consultation with PSI Psychometric Consulting Services. The new examination specifications call for minor adjustments to the number of points per topic within all sections of the examination. No new topics were introduced in any examination area. The most significant modification is the elimination of several practice area tests under the Substantive Law section. The Job Task Analysis study demonstrated that, on a nationwide basis, a low percentage of paralegals utilize the knowledge and skills tested by these practice area examination sections on a regular and routine basis in the workplace. In addition, the option to test in certain specialty practice areas will no longer be available to examinees. All examinees will take the same Substantive Law section of the examination, as is the case with all other sections of the Certified Paralegal examination. With these modifications, the Certifying Board listened to member and nonmember paralegals, and applied findings of the Job Task Analysis study to the exam specifications. The Certifying Board strives to link the Certified Paralegal examination directly to the day to day duties and responsibilities of paralegals in the workplace. The modifications announced for the September 2013 examination are a continued effort to ensure the Certified Paralegal examination remains an accurate and relevant reflection of the duties and responsibilities of today’s paralegals. 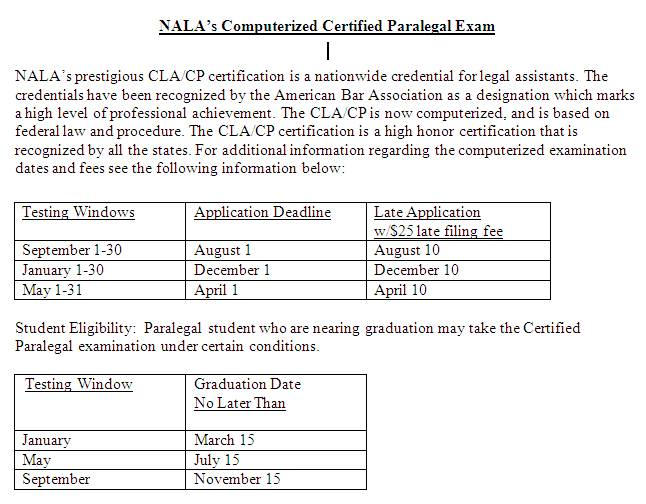 A detailed list of specifications for the Certified Paralegal examination may be found on the NALA web site under “Certification/Certified Paralegal Exam Description” as well as a more detailed statement of these modifications or click here for an overview.